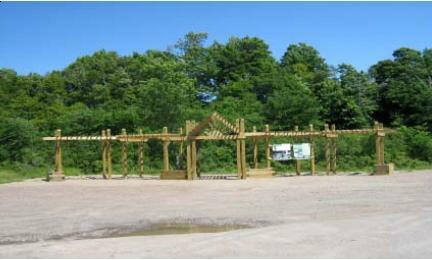 On 23 June 2007 the Elizabeth Bishop Society of Nova Scotia and the Great Village Historical Society unveiled a pergola-style historical display in Great Village, N.S. Both societies began work on this project several years ago, and after considerably fundraising were able to construct the structure and install the initial two panels, both of which are about Elizabeth Bishop’s connection to Great Village and Nova Scotia in general. The structure has room for 14 more panels, which will address various aspects of the history of Great Village, such as architecture, shipbuilding, agriculture, and other famous sons and daughters. The ribbon-cutting was held in conjunction with the EBSNS AGM, and over 50 people gathered to help celebrate the completion of the first stage of the project. The structure sits beside the Great Village River, in view of Elizabeth Bishop’s childhood home at the very centre of the Village. Residents and visitors alike will be able to learn about the many interesting aspects of the history of the village, and the structure will act as the starting point for the EBSNS’s booklet, Elizabeth Bishop’s Great Village: A Self-Guided Walking Tour.If anyone is interested in obtaining this booklet, or would like more information about the EBSNS, contact Sandra Barry at slbarry@ns.sympatico.ca. Also tune in to the BBC Radio Documentary on Bishop in Great Village on Nov. 18 at 9:45-10:30 p.m. U.K. time. It will then be available on the website: www.bbc.co.uk through their “Play Again” link. Who would not welcome the publication of a volume promising in its subtitle “Uncollected Poems, Drafts, and Fragments” of Elizabeth Bishop’s? Well, Helen Vendler for one, and if Vendler is right, Elizabeth Bishop, who would be just as outraged at the publication of her “Repudiated Poems.” Not so those who spoke in the two sessions on Edgar Allan Poe & The Juke-Box that Bethany Hicok convened and chaired. Can poems be pudiated? Why Bishop chose not to include the four poems in A Cold Spring or the “Elsewhere” section of Questions of Travels is puzzling, but even odder was their exclusion from the lackluster “New and Uncollected Work” that Bishop affixed to the end of the 1969 Complete Poems. Was she saving better drafts for a later volume? Berger speculates that she obscured reasons that lay behind her resistance to finishing certain poems by publishing less vexed but much less interesting poems. Jonathan Ellis had the gumption to take on both Helen Vendler and Alice Quinn in his paper, “Alice in Wonderland.” Vendler argued in her self-defeating review of Quinn’s edition in The New Republic (April 3, 2006) that the subtitle “Uncollected Poems, Drafts, and Fragments” should be changed to “Repudiated Poems,” and she urged that students “eagerly waiting to buy ‘the new book by Elizabeth Bishop’ should be told to go back and buy the old one, where the poet represents herself as she wished to be known. The eighty-odd poems that this famous perfectionist allowed to be printed over the years are ‘Elizabeth Bishop’ as a poet. This book is not” (p. 33). Bishop herself could be charged, however, with cooking the books when it came to her 1969 volume, The Complete Poems, which was anything but “complete,” since it left out all manner of poems later to find a home in the juvenilia and uncollected sections of the 1983 Complete Poems. As for the 1983 Complete Poems being the book “where the poet represents herself as she wished to be known,” the “Publisher’s Note” blithely declares that there are numerous poems in it she “would not have reprinted” (p. xi). Ellis pointed out that it does not even reproduce the individual volumes of her poetry as Bishop wanted. Edgar Allan Poe and the Juke-Box may be said to ignore Bishop’s wishes, but the 1983 Complete Poems cannot be held up as a model of fidelity to them. Looking for trouble, Ellis also contended that Vendler’s invocation of Bishop as “this famous perfectionist” ignores, as critics ritually do, the truth of the matter: Bishop is not always the best judge of her poetry, as may be seen both in some poems she included in her collections and several she left out. What bothered Ellis about the Quinn edition was not the presence of this or that Bishop draft or fragment but the presence of so much Quinn, whose expansive notes accompa own discrimination and, the fact we had only perfect poems.” Quinn’s notion of her edition as a compilation of “unfinished things” is not that different from Vendler’s subtitling it “Repudiated Poems.” Remarks of hers in lectures and talks promoting the book reveal her anxiety about the artistic merits of many of the poems she included. Ellis deplored Quinn’s tactlessness, sensationalism, and inaccuracies in her notes, which abound with biographical information and disinformation to which the aesthetic must bow, and criticized her editorial methods, including picking and choosing on the basis of comparative legibility which draft to transcribe. Well, no edition is perfect. Nor was Bishop. Alice Quinn’s edition raises questions not simply about what Bishop left and what Quinn did with it, but what Bishop herself would have done with what she left behind in drafts and fragments had she lived another seven years. To jump-start his paper, “Geography IV, or the Death of the Author Revisited: An Essay in Speculative Bibliography,” Thomas Travisano bade us imagine. . . . Elizabeth Bishop, at the age of sixty-eight, visits a brilliant Boston cardiologist and receives timely medical treatment and advice, thereby avoiding what might have been her sudden death from a cerebral aneurysm in October 1979. Without benefit of booze or cigarettes, she lives on into the 1980s, increasingly frail physically, but artistically still vigorous. At last, in 1986, when Bishop reaches age seventy-five, and in sync with her roughly ten-year intervals between books, Farrar, Straus and Giroux brings out what proves to be her final volume of poems, Geography IV. The reviews are almost universally admiring, but many reviewers admit to being startled by a new directness, sometimes even a certain rawness or indelicacy in the work of a poet they no longer refer to as Miss Bishop. Where was Bishop’s career going when she died so suddenly, and with so many poems actively in progress? How would we now think of her once Geography IV was added to the oeuvre? Bishop had recently completed four new poems for The New Yorker, three of which, “Santarém,” “North Haven,” and “Pink Dog” had already appeared, and “Sonnet,” which was to appear three weeks after her death. With four strong poems in the bank, she had a good start on Geography IV, which she would have had seven years to complete. Some poems would have been entirely new, but given her previous habit of working and reworking poems, often over many years, it is likely she would have drawn on many poems already in progress. Positing an outline for a notional Geography IV, Travisano identified five concerns that Bishop turned to in her last New Yorker poems and in others she was working on. A newly explicit political dimension would emerge in a series of “Reconsiderations of Brazil,” with Brazil also becoming a nexus of memory resembling in its imaginative presence and power Bishop’s long-lost Nova Scotia. “Childhood Memories Extended,” stemming from a large number of poems in manuscript, some of which were being actively drafted and redrafted, would tenderly recall female caregivers; others would piercingly investigate her relationship with her mother, and possible links to Bishop’s alcoholism. “The Further Art of Losing” would feature poems nearing completion such as “For Grandfather” and – expressing the pain of losing Lota de Macedo Soares – “Aubade and Elegy.” Bishop’s posthumous “Sonnet” would join a number of “Abstract Self-Portraits,” such as the marvellous manuscript monologue “Keaton” (Buster not Diane). More uncertain is the extent to which Bishop would have disclosed her lesbian sexuality in “Poems of Love and Sexuality,” now published by Quinn and already familiar to Bishop scholars. Jeffrey Gray’s paper, “Postcards and Sunsets: A Problem of Revision in Elizabeth Bishop,” pinpointed two questions that Quinn’s edition raises: which poems Quinn included and which she didn’t, and which of the various drafts were chosen. Quinn says surprisingly little in her introduction about her choice of poems, beyond having found some of the material “compelling” (xv). As for the drafts, she “sought to present the most coherent, the most intact” (xv), and chose “the fullest and/or most legible available rather than opt for a less decipherable or less complete version of a more advanced draft” (xvii-xviii). She thus left aside “restrictively fragmentary” writing that does not “indicate to a certain degree something of [Bishop’s] artistic ambition” (xvii). Pursuing the question of Quinn’s choice of drafts, Gray looked closely at a draft she rejected, “Florida Revisited,” and her preferred draft, “(Florida Revisted)?”, which he also compared with other drafts and “Florida,” from North and South. Sunsets, mentioned in Gray’s title, appear in various versions of “Florida Revisited,” as well as “Santarém” and some prose texts, and are a handy metaphor. Poems, Bishop seems to say, resemble sunsets: they run the risk of becoming bad postcards–”the poorest / post-card of itself” is how, in 1938, she describes “Florida.” Nature’s suffocating excess is a recurrent theme in Bishop, but as the1960s became the 1970s she celebrated Nature’s abundance, even its chaos, as aesthetically and spiritually irresistible. Bishop strove to contain sentiment while not losing sight of the wonder that precipitates the poems and suffuses the best of them. Examining multiple drafts and the earlier “Florida,” Gray traced in them a characteristic struggle waged between transcendence and fear of sentiment. His own work with manuscripts at Vassar enabled him to show that Quinn did not even choose the draft most in accord with her own stated norms. He also noted that “Florida Revisited” in all its versions except the one chosen by Quinn–”(Florida Revisited)?”–is largely anti-visionary, more so even than “Florida,” which presents a qualified transcendence. The wire’s technological extrapolation of nature’s currency, the vine, did not come easily, as may be seen in the early poem, “A Warning to Salesman.” In “Full Moon, Key West” Bishop’s tentative imagination, countering norms of heterosexual culture, treads “the narrow sidewalks / of cement / that carries sounds / like tampered wires .. . .” More stunningly, Bishop becomes a prophetic architect who merges nature and technology in “‘The walls went on for years & years . . .’”, with its striking nine-line passage within which “Up the bricks outside / climbed grill-work balconies / all green, the wires were like vines.” An accretion of imagery, closely examined by Cleghorn, lends physical, man-made constructions a fluid, surreal life of their own, which is empowered naturally by a simile that has them acting like vines. Reading the poem, we feel the past crumble into a future that wires nature into present constructions of desire. As Cleghorn concludes, breathlessness is accorded breath in Quinn’s edition, which imparts explosive amplitudes measured against the constraints of traditional poetic tropes, restrained voices, and the narrow boundaries of cultural norms. “It is marvellous to wake up together” and “Edgar Allan Poe & The Juke-Box” best embody Bishop’s rewired sexuality in a volume that enables readers thoroughly to explore the dream workings of a poet bursting from the natured confines of her time, swinging by green vines through wires of sound and light to transmit electricity for an erotically ample future. The distinction Ellis makes here is important. His refocusing of attention in literary criticism on “the reading process” itself, which in the past 30 years has often become “secondary” to “political readings of art,” as he notes, couldn’t be more timely. It should be said that in his attention to close reading, Ellis does not abandon how Bishop responded to current and political events. His chapter on Bishop and travel, which deals in part with Bishop’s responses to politics, is an example of his attention to Bishop’s cultural context and how she shapes her career within that context. But Ellis is careful not to put too much pressure on the context in order to create readings of Bishop that support a particular political position. Rather, he is a careful reader of the poetry, both published and unpublished, as well as the letters, notebooks, journals, drafts and fragments Bishop produced throughout her career. Ellis offers some surprising new readings and groupings of Bishop’s writing. Overall, this is a useful new book in Bishop studies, but I think its greatest contribution is a superb chapter on the letters. Ellis encourages us to read Bishop’s letters as literary genre and teaches us how to do so. In keeping with his desire to steer clear of biographical reductionism, Ellis’s readings of Bishop’s work proceed in non-linear fashion and are structured around “the artistic forms of Bishop’s writing rather than the facts of her life.” Bishop’s translations of memory into art is the major organizing principle of the book, as the title suggests, and there is much new material gleaned from the archives to inject new life into Bishop scholarship, allowing Ellis to place more emphasis on neglected influences on Bishop’s writing, including her Canadian past and her European travel experience. In the first half of the book, Ellis focuses on what he calls “physical hideaways,” such as imaginary icebergs, snow forts, darkened rooms and haunted villages, that recur in Bishop’s work. In these chapters, Ellis stages readings of Bishop’s various imaginative returns to a particular space, which allow him to link early work to later work in interesting ways. In Ellis’s reading, arctic images, for instance, become a harbor for both positive and negative childhood memory. Ellis assembles an impressive archival arsenal of early stories, notebooks, letters and early unpublished poems, in order to trace Bishop’s successful (and unsuccessful) attempts to translate memory into art. Here, Ellis explores the relationship between the autobiographical “tone” of the notebooks and drafts and the “apparent impersonality of the published work by following the history of a single geographical trope through Bishop’s career: the iceberg and snowfall.” Two unpublished poems from the 1930s, “Sled Poem” and “In the Tower,” are placed alongside “The Imaginary Iceberg,” also written in the 1930s. Ellis demonstrates convincingly how these same memory traces re-emerge in the 1970s with the late poem “In the Waiting Room.” The first half of the book continues with considerations of Bishop’s use of the seaside and ideas of home, featuring notable readings of Bishop’s poetry alongside her artwork. While Ellis’s approach to Bishop’s career is not entirely new, his attention to form in his analysis and his careful attention to the rich archival record that steers clear of a particular political agenda, allows for fresh groupings of poems and new ways of seeing Bishop’s familiar tropes. In Part II, Ellis investigates, as he puts it, “some of Bishop’s favourite ways of wasting imaginative time, from travelling…to writing letters.” Ellis looks at the relationship between poetic form and politics and, in what is to my mind the centerpiece chapter of the book, treats the “art of letter writing as a genre in its own right.” In the first chapter of this section, “Travelling,” Ellis provides a more nuanced account of Bishop’s travels in Europe, and particularly Spain, than have previous critics. Mostly this experience has been ignored in the criticism. Bishop spent time in Madrid and Seville in the mid-1930s just before the Spanish Civil War broke out, and Ellis shows how this experience influenced her work. In a richly layered reading, Ellis demonstrates that while Bishop’s understanding of Spain and its politics and culture appear limited, at best, in some of her early writing from Spain, the country also figures as a location for exploring what mattered to her in poetry, and her experience there serves as an impetus for a subtle critique of American non-interventionist policies in Europe. He begins with Bishop’s 1936 previously unpublished poem set in Spain, “In a Room (Seville, 1936),” which apart from the subtitle, does not mention Spain. This interesting, skillful and almost finished poem has now been published in Edgar Allan Poe and the Juke-Box, a grouping of Bishop’s previously uncollected poems, drafts, and fragments, edited by New Yorker poetry editor Alice Quinn. Ellis not only offers a strong reading of this poem and its links to memories of the maternal, he uses it as a launching pad, via the mysterious appearance of the cat at the end of the poem, for discussions of the intersection between politics and art. He draws on other Bishop stories and poems written about the same time that appear to refer (at least through allusion) to events in Spain or U.S. policies towards Spain. Ellis reads the characteristics of such hyphenated creatures as “The Gentleman of Shalott” and “The Man-Moth,” for instance, as representing “many of the main political stances of the time” as “so many American politicians dithered over the question of intervention” during the Spanish Civil War. He also shows how Bishop’s fable, “The Hanging of the Mouse,” as well as the poem “Lullaby for the Cat” (1937) share this same political landscape. Such connections allow Ellis to link these writings in interesting ways to what has been read as the more overtly political of the 1930s poems, “Roosters” (1940), which was at least partly inspired by Picasso’s Guernica. Here he offers lively new readings of Bishop’s work, casting new light on the neglected European influences. Also in this chapter Ellis offers an alternative perspective on reading “Songs for a Colored Singer,” a poem that has been problematic for Bishop’s critics because of its socalled appropriation of a black woman’s voice. Using Toni Morrison’s critical arguments on how white writers have used blackness to raise taboo issues in their work, Ellis demonstrates convincingly that the poem “gives dissent a voice” and exposes some of the racial contradictions of the period. Ellis concludes that Bishop’s voice of protest can best be understood as existing in “‘shades and shadows.’” This is not a new point, but Ellis, through his reading of Bishop’s lesser known drafts and fragments, as well as her journals and notebooks, does offer us new ways into Bishop’s work. From here, Ellis moves to a fascinating chapter that considers the art of letter writing. Ellis points out that Bishop herself saw letters as a distinct literary genre, and so Ellis encourages his readers to read them not as autobiography but as “a blueprint for a new literary genre.” To this end, the chapter offers a number of revelations. Ellis gives his readers good insight on reading Bishop’s reaction to Sylvia Plath’s Letters Home; he demonstrates how letter writing “short-circuited some of [Bishop’s] laborious revision process” through the writing of what he calls “letter-poems”; he shows how a poem in a letter to Moore about Bishop’s landlady is “really a continuation of the two poets’ regular discussion of language and form”; and he shows how Bishop’s attention to the craft of letter writing led her to see Lowell’s appropriation of Elizabeth Hardwick’s words in The Dolphin as an act of plagiarism. Because Bishop saw letters as an art form in their own right, lifting someone else’s words constituted a form of stealing. Ellis’s section on “the love letter as a possible vehicle for art” offers wonderful readings of unpublished poetry, such as the “Blue Postman.” This interesting little poem isn’t even in Edgar Allan Poe and the Juke-Box. Again, Ellis’s book is a timely one, as it further underscores the point he makes early on: with all this new material, writing about Bishop becomes particularly exciting because her reputation is still being formed. And so much of Bishop’s writing has been left out of the published work. Ellis points out that Robert Giroux’s decision not to include Bishop’s letters to relatives in the selected volume of letters obscures the influence of family members, who acted as mentors and readers, on Bishop’s art. Anyone who has taken the time to read Bishop’s artfully crafted letters would have to agree with Ellis’s conclusion that, “…as with Keats, Bishop’s letters and poems are both required reading.” I have but one quibble with Ellis’s treatment of correspondence and that is that he does not always identify the addressee of the letters he is quoting, some of which are unpublished; surely this is important information given his argument. If Bishop is treating letters as an art form, then her intended audience would determine, in part, the style and tone of the letter. Her letters to her Vassar friend Frani Blough Muser, for example, may be as important in her development of style as her letters to Moore, and they are strikingly different in tone. Ellis’s final chapter provides an insightful reading of “The Moose” and other poems; here Ellis traces Bishop’s career development through the extraordinarily long composition process (26 years) of “The Moose.” Bishop often began poems years before they were actually completed, making us wonder, with the advent of all these new drafts and fragments, of whether there were many more poems that might have been completed along the lines of Bishop’s great final poems. The final chapter illustrates in microcosm Ellis’s method of reading that allows for fresh and nuanced new readings of Bishop’s life and work. As Ellis travels backwards and forwards between letters, drafts, notebooks, journals, published prose and poems, he reveals the forms that emerge, overlap, inform and influence Bishop’s life and art. citizen. Please send intuitions, ideas or abstracts to the panel organizer at <travisanot@hartwick.edu>. Travisano is also organizing a panel at ALA on “Robert Lowell and the Anxieties of Empire” for the newly formed Robert Lowell Society. He invites submissions for that panel as well. The Elizabeth Bishop Bulletin, a semi-annual publication of The Elizabeth Bishop Society, is edited by Angus Cleghorn at Seneca College, with assistance from Josie Sage.